What features does Sleeper have that other platforms don't have? Features on Sleeper that you wish ESPN, Yahoo!, and other platforms have. People who are interested in switching to Sleeper often spend a lot of time focused on what they might lose if they make the switch. The short answer is that unless you have some really weird way of doing scoring that ESPN, Yahoo!, or FleaFlicker does not support, then we already handle your specific use case. In this article, I will be detailing features that are exclusive to Sleeper Fantasy Football. We think you'll like it! 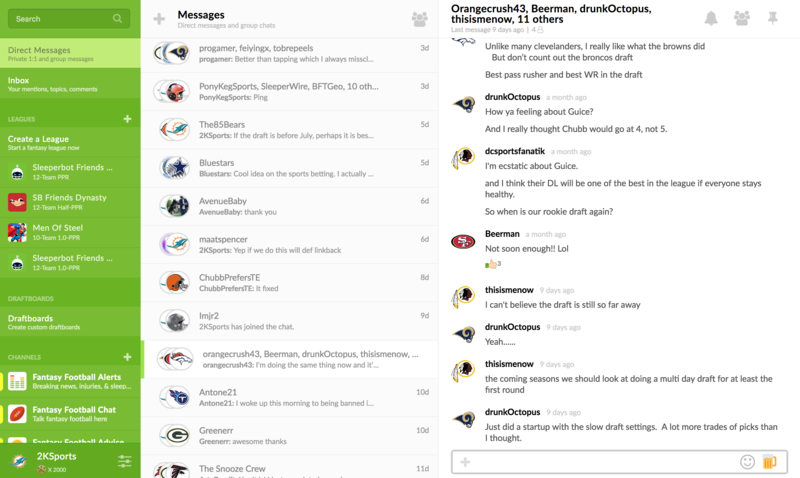 Here is a screenshot of our league chat from the middle of last season. If you've ever used Slack or Discord, this interface may seem familiar to you. You can see that free agent moves as well as league banter all happen within this chat. You can also send photos, conduct polls, and issue challenges directly from the chat. This chat is identical on mobile as it is on web, and sends push notifications to your phone when you are away. Simply put, league chat is the best way to stay connected, no matter what platform you use, and it's the single reason that our leagues are considered the most active and fun of all the platforms. We care deeply about facilitating communication between leaguemates because we know that it is very difficult to get in touch with owners in your league unless you are close friends. With Sleeper, more trades happen because more discussions happen. Less people miss draft times because everyone is more organized and informed. 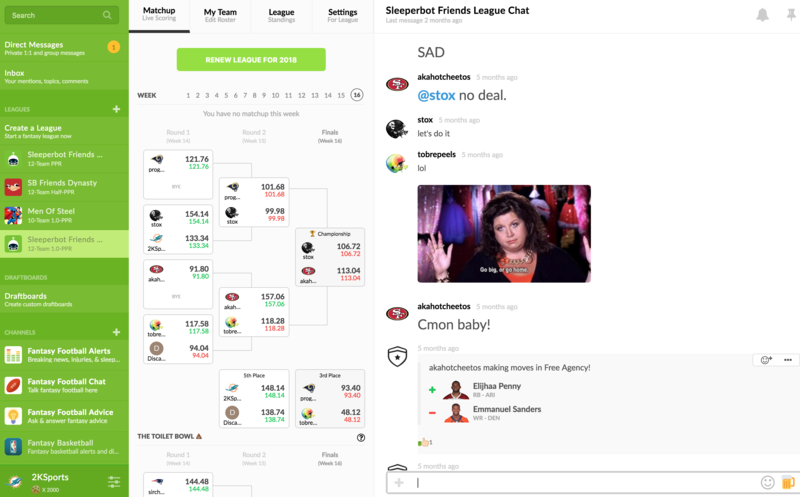 We've been screwed in the past by both online and offline drafts, so we made the product that solved every draft day problem we've encountered - the Sleeper Draftboard. 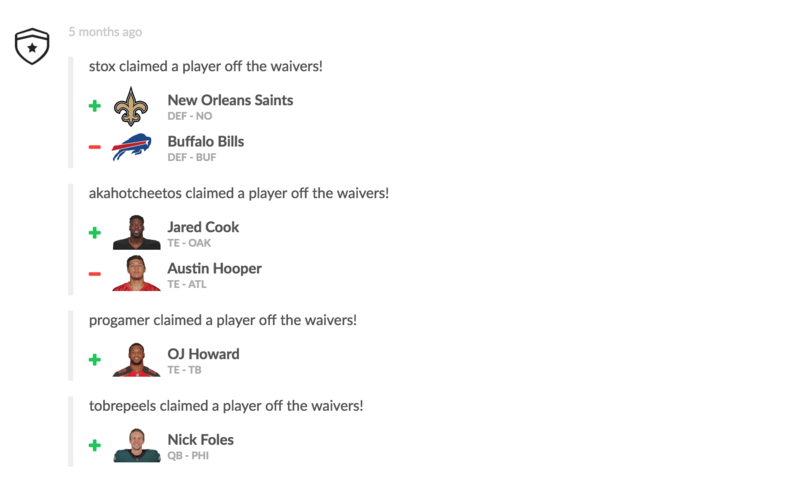 The draftboard offers total commissioner control at all times, with unlimited pick changes, pauses, and undos. You can start the draft at any time, in case people are late. Half your league can be drafting on the big screen while the other half drafts remotely. It works perfectly on web and mobile. Lastly, we designed the interface to be a board so you can easily see when position runs are happening, and the positional needs of your opponents. The board has TV mode and Light/Dark Theme as well. Nobody else offers this experience in their draft. We understand how important the draft is, and how flexible software needs to be to solve those problems. The fastest scores period. Your fantasy scores update before you see it on TV, every time. Live play by plays of your matchup with contextual fantasy points. Contextual box scores based on your fantasy scoring settings. No more looking at box scores that only show stats and trying to do conversions in your head. Quick access to see all top performers of the week in a real-time dashboard. Videos and highlights throughout the day. A visual representation of how far away each of your players are from the endzone on a football field UI. We're constantly iterating on the GameDay experience because this is when owners spend the most time looking at the app. The Waiver Countdown turns your Tuesday waivers experience into a major weekly event that your leaguemates will look forward to. Spamming refresh on your league while not knowing if your waivers will process at 1:00am or 4:00am is a thing of the past. By default, we process Tuesday waivers at exactly 12:05am, every week, and not a second later. You can learn more about our waiver options here: How do waivers work? Have you ever wanted to acquire a player, but you were not the perfect trade partner? With Sleeper, you can start a group chat to discuss the possibilities of a 3-way trade, and then make it happen in our multi-team trade interface. 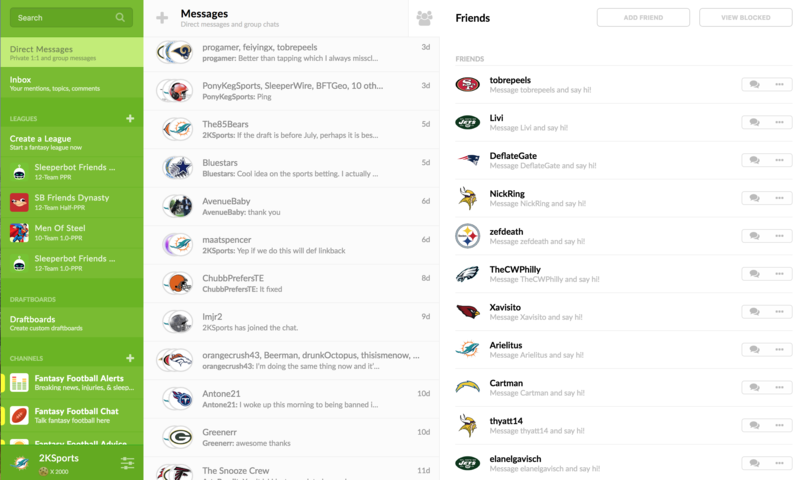 Our goal is to make trading feel like an authentic NFL GM experience, done through an intuitive user interface. You can customize your final standings to affect playoff seeding based on your own rules. For example, some leagues will have the points leader be the second seed instead of the second place team based on record. With Sleeper, you will be able to chat with other owners of the same player. This was a popular feature two years ago that we are bringing back for this season. You can cheer your player's performance, or lament their poor performance. You can even ask other owners for advice on what to do.